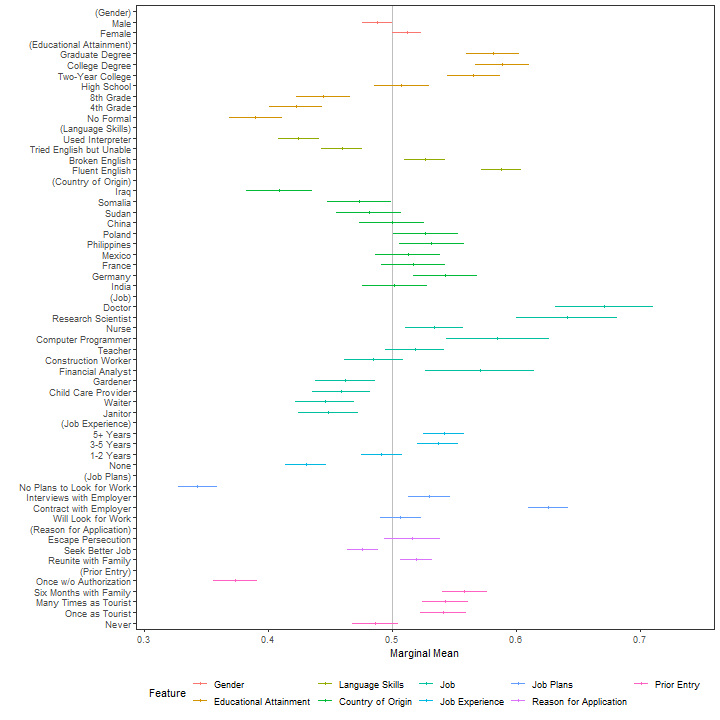 Simple tidying, analysis, and visualization of conjoint (factorial) experiments, including estimation and visualization of average marginal component effects ('AMCEs') and marginal means ('MMs') for weighted and un-weighted survey data, along with useful reference category diagnostics and statistical tests. Estimation of 'AMCEs' is based upon methods described by Hainmueller, Hopkins, and Yamamoto (2014) . Following tidy data principles throughout, so that all of the main functions produce consistently structured, metadata-rich data frames. Thus the response from any function is a tidy data frame that can easily be stacked with others (e.g., for computing AMCEs for subsets of respondents) and then producing ggplot2 visualizations. A formula-based interface that meshes well with the underlying survey-based effect estimation API. A consistent interface for both unconstrained and two-way constrained designs that relies only on formula notation without any package-specific "design" specification. Conjoint designs involving two-way constraints between features are easily supported using simple formula notation: Y ~ A + B + C implies an unconstrained design, while Y ~ A * B + C implies a constraint between levels of features A and B. cregg figures out the constraints automatically without needing to further specify them explicitly. Using "label" attributes on variables to provide pretty printing, with options to relabel features or plots on the fly. The cj_df() function (and data frame class "cj_df") is designed to preserve these attributes during subsetting. All functions have arguments in data-formula order, making it simple to pipe into them via the magrittr pipe (%>%). A detailed website showcasing package functionality is available at: https://thomasleeper.com/cregg/. Contributions and feedback are welcome on GitHub. The package, whose primary point of contact is cj(), takes its name from the surname of a famous White House Press Secretary. cregg functions uses attr(data$feature, "label") to provide pretty printing of feature labels, so that variable names can be arbitrary. These can be overwritten using the feature_labels argument to override these settings. Feature levels are always deduced from the levels() of righthand-side variables in the model specification. All variables should be factors with levels in desired display order. Similarly, the plotted order of features is given by the order of terms in the RHS formula unless overridden by the order of variable names given in feature_order. which provides a test of whether any of the interactions between the by variable and feature levels differ from zero. Again, a detailed website showcasing package functionality is available at: https://thomasleeper.com/cregg/ and the content thereof is installed as a vignette. The package documentation provides further examples. cj() now imposes class "cj_df" on data to preserve attributes during subsetting. Added function cj_table(), which can be useful in communicating the set of features and levels used in the design as a data frame (e.g,. using knitr::kable(cj_table(data, ~ feat1 + feat2))). Renamed functions props() -> cj_props() and freqs() to cj_freqs() for API consistency. Added function cj_df(), which provides a modified data frame class ("cj_df") that preserves variable "label" attributes when subsetting. Built-in datasets immigration and taxes gain a "cj_df" class. cj_tidy() now returns objects of class c("cj_df", "data.frame"). Added function cj_tidy() to tidy a "wide" respondent-length conjoint dataset into a "long" respondenttaskalternative-length dataset. An example dataset, wide_conjoint, is provided for examples and testing. Added tests for accuracy of AMCEs in two-way constrained and fully unconstrained designs. Removed margins dependency, leaving only linear probability model support. 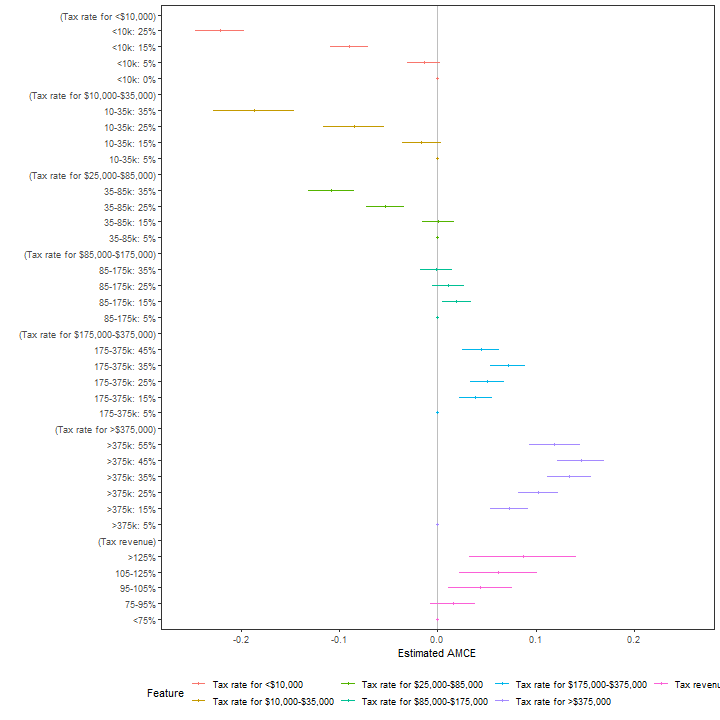 Added another example datast, taxes, from Ballard-Rosa et al. (2016). Renamed hainmueller dataset to immigration. Expanded test suite to cover survey-weighted data. Note: cj_anova() currently does not work with weighted data due to a bug in survey::anova.svyglm(). Cleaned up internal code for consistency. Added 'statistic' column to function outputs. Fixed a factor ordering issue in mm_diffs(). Added tests of numeric accuracy of estimates for all main functions. Added new function mm_diffs() for calculating differences in marginal means. mm() gains an h0 argument to specify a null hypothesis values so that z statistics and p-values are meaningful. Cleaned up documentation and expanded 'Introduction' vignette, moving README content to there. Require survey version 0.33 (for family argument). Added amce_diffs() and amce_anova() functions to assess differences in AMCEs by a grouping variable. Fixed a bug in the creation of svydesign() objects that was generating incorrect variance estimates. 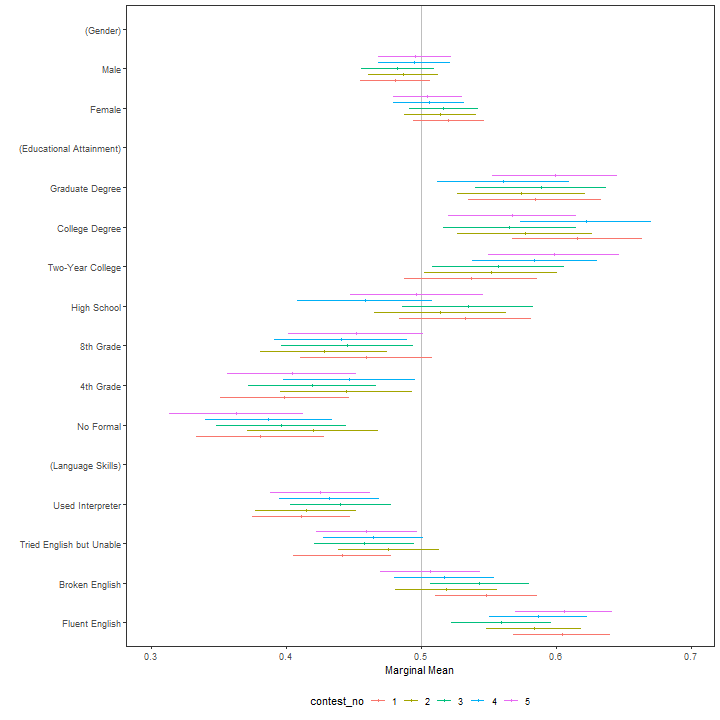 Fully imported ggplot2 and ggstance. Changed the level argument to alpha to avoid ambiguity with "levels" in the "feature level" sense used in the package (as opposed to the intended alpha or significance level). Changed name of freq() to freqs() and prefixed class names of return values from all functions with cj_*. Added feature_order argument to all functions to regulate display order. Fixed a bug in the handling of header_fmt in plot(). Updated README with example of freqs().